I picked the contest winner! Congratulations to Kent of Brightwood Oregon! He won the trip for two with Chris Sessions! You'll have a blast! I am still really sick.... That means I had to give up the chance to fish with Thumper and Bruce Gipple. My throat is really sore, and canceling was really hard to swallow. I sure hope I get another chance someday. I hear he is awesome. The thought of heading to a river with a bunch of really knowledgeable guys had me all revved up. I love learning new fishing techniques and rivers. Nightime hide and go seek cold medicine. If you spill the little pills all over the floor, or step in puppy poop on the way, you lose. Match your drugs (Try not to cause a reaction when you take two of the wrong medicines together...) If you pass out, you lose. If you want more, you'll have to buy the book. You know, all it takes to make the world different, or better, is small acts of kindness. It makes YOU feel better, and it makes others feel good too! Why not call someone up, or e mail someone on the board that obviously doesn't have a boat and invite him/her fishing? Is there safety issues involved that prevent this? I have stopped to ask fishermen on the Kilchis road if they need a ride to their rig. I figure this is fairly safe, as they usually have hip boots, and or rods with them. Is it safe? Or am I crazy? People sometimes get really nervous and edgy as they approach me in a drift boat while I am drift fishing from shore out back. The look on their face says "disappointment". They expect to have to drift on through this good hole because I am there. I used to be fairly possessive of it. I changed my tune recently. It's so much more fun to let the drift boat guys have a try at it, plugging it. I can fish it any old day. They probably drove hours to get to drift the Kilchis. What simple little acts of kindness can we show to our fellow anglers in the upcoming year? I guarantee you that the reaction you get when you are kind is as big of a rush as a fish... (Well.... ALMOST!) Another one: When you see a guide on the river, be kind to them! Say things that make the clients feel good about their guide, which in turn make the guide feel good. Be kind to our fine anglered friends! Kindness is catching. So is my cold. Which do you want? I just LOVE this! Sent in to me by Lipripper. Author Unknown. She stopped-shook her head, and breathed, "You're too fast." The Doctor gave me antibiotics for this coastal crud that I am harboring. Somehow, I wonder if it will do any good. I need to rest! I just need plain, old fashioned rest... and a fish! I try to nap, to doze off... The river is noisy and full of fish. The steelhead! They wave as they go by, calling my name! "Hi Jennnnie!" Neener, neener, neeeeeener!!! They taunt me! It's no use. I can't sleep. Maybe, I tell myself, maybe if I bundle up, it will all be O.K. I'll still get well, right? I need to be happy to get well. It's a mental thing. A fish fight will make me well and happy! I won't drift fish, that takes too much exertion. I'll just wade out in the riffles and hold a hot shot out there. Very relaxing. Dang, I could almost take a nap! I can get well out here, right? A sudden jerk on my rod brings with it a quick intake of breath. The fish doesn't hold, but now I'm standing in the middle of the river hacking, bent over, struggling to get to shore. The current pulls at my legs, as they nearly give. I'm dizzy. The cold wind blows in my ears and they ache. "It's nothing, I'm fine!" I call to Bill. He shakes his head, hopelessly. If I bundle up, and ride in the boat, that would be fine. That won't hurt, right? I down some aspirin, and snuggle up in the boat seat. I'm not rowing, or exerting, so it's a good and restful thing. The waves will lap at the boat side, soothing my soul and bringing forth wellness! I know that I'm not sick anymore when the fish around us start becoming active. Bill's rod goes down three times. I'm screaming, and madly netting or unhooking fish! "I'm fine! I'm fine! I'm _____!" What happened to my voice? I can't talk! My throat aches! My nose is running! My ears ache! But I netted the fish! I am happy! Happy is good, right? Then why am I here, this morning, with a headache and kleenex? My thermometer registers just a little over normal. I'm thirsty. I only had to get up 4 times last night to take cough syrup. It is simply because I have not caught my share of steelhead yet. My passion to get well is enormous! How am I going to make my rod go down today? I will get well. I will. I just need one more steelie.... Then I can rest. If only the doctor knew what I really needed. If only a doctor could prescribe the right conditions for a fish. He would be a very rich and sought after doctor indeed. My doctor gave me a 5 day pack of something called Zithromax. He needs to start prescribing a 5 day pack of Oncorhynchus Mykiss. Actually, I did call him. I said I would call him about a month ago, but I didn't. I called him a week ago, and he was out. I was supposed to call after the holidays... When will they be over? Every day I hook a fish is a holiday. It'll be someday, I'm sure! I went out in the rain and wind, and really shouldn't have. I'm sicker today than yesterday. Is this possible? YUCK! We went pulling plugs for steelies. When you catch a steelie on a plug, did you really catch him? I have a rare and unpopular belief about pulling plugs for steelies. I just don't feel very accomplished when I do it. I feel a little better if I am rowing and get someone else's plug on a fish. When I catch one on a jig, I feel better yet. Especially if I can mange it on the first cast. When I catch one on drift gear though... I REALLY caught a steelie! If I were ever to catch one on a fly, I think I'd go ballistic. That would be my dream steelie! Bill insists, and I have read in multiple articles not to hold the rod. Chances are better that you will stick a fish and keep it stuck if it is in the rod holder. But, but, but, but... the biggest thrill for me is feeling the take. It drives me nuts! I love it! If my only job in fishing for steelies is letting the line out, setting it in the rod holder and waiting for it to go off, I get bored. Coffee and doughnuts are great, but I want to fish! Bill said that I would react too quickly if I held it. I'm stubborn. "Oh, yeah?" Suddenly it took, and dang it, I felt it, and dang it, it felt good, and dang it if I wasn't so patient that it drove Bill nuts. My legs were crossed, as I sat in the comfy boat seat. One hand held coffee, the other, the pulsing rod. We were quietly conversing about a mink that was dodging in and out of the rocks on the bank. My rod jerked. I remained cool and calm. I had practiced this scenario in my head for so many seasons it was fixed in my non reaction. It arched a heavy arch and pulllllled. "Bill?" I waited for a response. "Bill, dear? I have a fish on... shall I take him now?" Time passed as he glanced at my dancing rod. "All right then, dear". After a few more seconds, I stood, and gave it all I had. A wobbly 35 Hot Shot began it's boring pulse again. I brought it in to reveal a bent hook. So now... I'm left wondering. If it is, indeed true...Why is it that you lose more fish holding it? I'm thinking that no matter what, your hand is soft, and when they hit, your hand has to give a little. Does this give the fish a chance to spit it? A rod holder is plastic, hard, ungiving. When they hit, there is solid resistance. Or is it that they can feel life on the other end and it scares them? What IS IT!? I did not take the fish too fast. I'm not one to really care all that much that I lost the fish. I got to feel it hit, and it gave me a huge thrill. I'd do it again, I'm so dang stubborn, especially when I'm sick. I didn't have to clean fish, net fish, take hooks out of fish, or put up eggs and vac pac meat. I just got the tremendous thrill of feeling a mysterious creature come out of the heavy current under-brush and grab my lure. Now, Bill, on the other hand, left his rod in the holder. See Bill not hold rod. See Bill's rod go down. See Bill have work to do. I counted 15 pills and swallowed them all this morning. Vitamins galore. Dangit, I'm going to get well! Isn't it interesting that when you get sick you finally decide to get healthy? I'm eating brown rice and tofu and veggies! I'm eating all kinds of healthy herbs and vitamins! I'm doing yoga breathing and exercises! Watch me get well, dangit! I did sleep ALL night last night. When I woke up I was so excited! I didn't, to my knowledge, have one coughing attack! YAY! Yesterday I was grocery shopping and ran into Milton Fisher. He lives on the North Fork. I invited him over. It was one of those stormy, indoor days, where sitting around the table, drinking coffee, and discussing fly fishing or steelhead behavior was the normal course of things. I'll talk about what we came up with later. This morning, I have to get the kids up and drive David to school. The rivers are still very high, and I'm wondering if I can take the main roads, or have to detour. Off to check the roads link, and into the shower I go. I'm getting better. I know I am! Look out fish, I'm going to be on the hunt when the rivers go down! Kilchis the mutt pup is going to grow up thinking either his first or last name is "NO!" In any given day you will hear this word numerous times from every family member. It can be heard with a whining, angry, or a giggling tone. Sometimes it happens while Kilchis grabs your hand with those wicked puppy teeth while playing. Bill likes to show off his hands, which will someday heal, I tell him. Sometimes you hear "KILCHIS, NO!" when Andrew's favorite shoes are out. When Bill discovers cute little chew marks on his coffee table it is "OH NOOOO, KILCHIS!" When I take a break from office work and find my clients portfolio all over the floor, I say, "Oh Kilchis! NOOOOO!" "Is my web page coming along?" My clients ask. "Well yes, it's coming along just fine!" As soon as I paste all these shredded bits of paper together, and glue your disk back together, we should be proceeding quite quickly. We have had eye to eye talks about how much he means to me, and he listens and wags his tail, or.... he chews me on the leg, with those little flea hunting puppy chews. He wants me to be flea free. Kilchis says he loves me too. "Now let's chew something!" He's learned the words, "Want to go fishing?" and heads straight to the mud room while I put on my rain gear. He's always happy, always ready to help. He has a job. He is my business partner. It's not just all play for this pup. I mean, after all, how do you think we keep our dishes clean? Off to Astoria to help Englund Marine with a new web page. Get ready for some heavy duty fishing, folks.... It's time! Put up another great, new Stan Fagerstrom column! "Professional Angler Reveals Secrets Of His Success At Fishing For Walleye"
Make sure you don't miss it! You can find his archived articles on the board here! Seems I'll never get a full night sleep again. It's been weeks. Funny thing, is that everyone I talk to says the same thing. Is it because I was used to the winter break, sleeping in a bit with the kids? Yesterday morning I noticed Kilchis wasn't feeling up to par. Last night he had a temp of almost 105. I started the medicine for salmon poisoning, and will take him in today. He's so floppy and sweet and wonderful when he is sick. I don't miss the chewing, but I know he is not well. He still wags his tail, and attempts to chew on my hand. He still shows joy and love and life, but it is apparent the amount of effort it takes him. It is a comfort to him and I, to hold him in my arms and play Mom. Last night, just before dark, Bill and I snuck out to the river for a couple of casts. You would never had known Kilchis was sick. The river does that to me also. I feel really sick in the house, yet when I hit the river's edge, I can't help but feel the energy. Kilchis and Dee Dee madly hunted for the dead salmon that the high water recklessly tossed upon shore. Up river, a salmon head pokes out of the river sand in a ghost like way. It has been dead for several weeks. It's body is buried, yet it's head is fixed there, in an upward stream position. It is frozen stiff in migration. It haunts me. The dogs bark at it, as if it is still alive. Bill has tried to bury it, yet the high water uncovers it every time. It perfectly and perhaps purposely exposes only it's head. It is spiritual to me. It brings to mind the thousands of salmon that must be buried under my feet as I walk the stream. Decomposed, they feed the tall trees that protect me. Millions of fish scales make up the soil that washes in and out with the high water, rearranging the rocks, and reforming sand bars. I am honored to live on the river, where whole life cycles come and go before my eyes. I am a guest here. The world around me is made up of life that for centuries has lived and breathed in this river. Life that has strength enough to easily carve a canyon through mountains of pure rock. The soil beneath my feet has a story to tell that I will never fully understand. There is energy here. Life, deep in the soil. I stop to stare up at the wall of tall trees that are fed by the river nutrients. Is there any doubt why we feel energy at the river's edge? I believe that it all starts with the salmon. The salmon that live, and fill our freezer for dinners to come. The salmon that die, and feed small animals and birds and trees. The salmon that are, and the salmon that centuries ago fed a small sapling, that now hovers, several salmon stories high, above me. The Trask 101 takeout has very recently been cleared out, to make access easier for trailers. The river looks very nice, good color and pressure is not heavy. Might be a good shot for a river that is not overly crowded this weekend. I heard that there are quite a few natives showing up this year. The Wilson at Sollie had 10 trailers when Bill passed yesterday, and looks fishable, although strong. Being a weekend, heavy pressure can be expected today and tomorrow. The Kilchis has been an absolute aluminum hatch over the last two to three days, as it the first to clear after a high water. Ten to twelve boats went down by 10 A.M. It is pulling strong, with beautiful color. I can't say anything for the fish here, though. I haven't hooked up, nor have I heard or seen a hook up since before the rains. I'm going out to try it out soon. Hooks in hook tackle boxes tend to get soaked all throughout steelhead season, when exposed to the elements. Dry your hook boxes and hooks after heavy exposure. When putting them back, coat them with a very light coat of WD 40 before putting them away. Plano has come out with a new waterproof tackle box, and I will have some soon! There goes my slipper! Kilchis, the salmon poisoned pup is on the mend. Amazing how puppies can have a 104 temperature, and still want to go fishing. I can relate! It's a banner year, eh? I can't buy a bite! I fished till I dropped, in between chores and internet work. The water was prime, yet all the drift boat anglers I exchanged pleasantries with hadn't seen much either. Bill and I drove way up the other side of the river yesterday and visited some pockets we haven't seen in a while. It is breathtaking, deep in the forest. It's steelhead season. The outdoors is the place to be. Climbing through thick, wet overgrowth, and down embankments to get to a clearing makes me happy, happy. I stand 10 feet up from the river bank, to peer into a deep still pool to search for silver flashes. Everything around me is still. Even though I see tracks from trucks, and boot imprints of anglers that had previously traveled this path, it seems untouched. Look up! Thick, dense forest where the animals live. A lone eagle soars over head. A wet branch slaps me in the face, reminding me to move on down. I'm here to fish. I dislodge my rod tip from a tangle behind me. Finally to shore, I run my favorite Silent Approach jig through the deep seam. This is a place I would love to drift, but the huge rocks and fallen trees in the water make it nearly impossible. I do this, again, and again... And again. Bill sloshes through the water to move a bit upstream to settle into a drift. I begin to lose faith in my technique and stare off into the lush foliage of the opposite wall of the canyon. I mindlessly cast. I always think I am coming here to fish. I know I'm here, for so much more than that. I finally did it. I'm going to the eye doctor. I have been trying to forget about it, but I'm doing it. I called, I wrote it on my calendar, and I'm following through this time. Tomorrow, 8:15, the head doctors at Casey Eye Institute are going to bully up on me. Line up down the halls and decide just how to start chopping me up! ARGH! You know though, it's time. I have a big knot on my forehead from running into the door that I didn't see. I can't tie a knot on my line worth a darn. I have trouble reading music while playing, and I'm tired of not seeing birds that Bill points out to me. It's time. But I'm still really scared!!! It'll be really nice to be able to see all the new smile lines around my eyes, and my gray hair! Want to see some pretty Siletz Fish? Want lip gloss that sticks around as long as jack salmon slime? Try lip gloss from MAC. It stays FOREVER, and I think it might be my new favorite fish catching lip gloss. Think that would make a great commercial for MAC stuff? "Lip gloss by MAC... better than salmon slime..." I'd buy it in a sec! I made it through my doctors appointments, and headed straight for Nordies. Nordies is a place you can forget all your problems. My eyes were dilated, so I shopped by Braille. I sat down and had a make up demo, felt all the clothes made of fine materials, tried on lingerie... just had a heck of a good-girl time! On the way home though, it sunk in. No amount of new lip gloss is going to make this problem go away. I need eye surgery. Or do I? The doc said it was time, but I don't have to do it! Of course I don't have to do it! I could do it within the next two weeks. But I don't have to!!! The cataract in my eye has really grown, which makes me very squeamish around bright lights. He had to shine a very bright light in my eye to see my retina. It was tough! I told the doctor, "That's OK. Go ahead, I can do it, I'll just pretend I'm fighting a steelhead." He noted that he'd never heard that one. "Out of commission for a short while..." he noted, if I go ahead with the surgery. 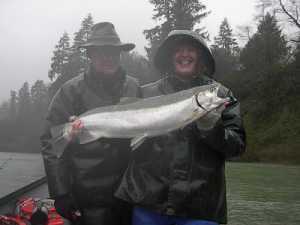 "Steelhead now till March-ish... then Spring Chinook... When would be a good time?" Eye have a decision to make. Think I'll go get my hair done today. The winners of the 1st Annual Eggs-scar Awards have been chosen! Congratulations! Winners, please send me your physical address so I may send you your winnings! I have read that nursing homes, hospitals, and recovery homes have had great success, when adding a pet or two for their patient's comfort and happiness. Pets seem to ward off depression and loneliness. When we had just Dee Dee, it was a pleasure to wake her, and give her a dog bone. She wagged her tail. She was happy, and it was contagious! Imagine, if you will, a wiggly, excited puppy in the morning, and Dee Dee's pleasant manner! Kilchis wakes me with enthusiasm for the new day. Kick started into the day by licks and wagging tails. I yawn, throw the covers back, and try not to smile. It's too early to smile, dangit. To the sink I go, with a wiggly one trailing at my pajama bottoms. We pad downstairs, and Kilchis greets Dee Dee. Old Dee Dee used to be a slow, gentle riser. Pleasant, but slow. Not anymore! Kilchis jumps on him, barking and excited, and initiates a happy morning party! Off to the treat box we go! The dogs bound outside with them. Even Dee is young now! An early morning bark fest rings out at the creatures of the night. I am free to pour that much needed first cup of joe. Kilchis won't allow any somber faces at dawn. Fun! Everyone get up! Join the party! Life is grand! A puppies enthusiasm is infectious. His energy forces me to get more exercise and fresh air. I am younger with this pup. Despite the times I have stepped in his messes, and trailed them through the living room... Despite the lack of sleep in his early days, despite the constant care he requires... I am well satisfied. It's tough work being happy, but I have no choice! When I am 90, and in a retirement home, I want a pup and an electric poop scoop. Ever order fries, salt them in the bag, munch away and suddenly realize you are eating the salt container? I am heading over the snowy, treacherous mountain pass for a reason. The.... Flotilla! A group of internet board people who get together and... FISH! I will endure anything for a fish, and anything to see the rest of the ifish clan! This will be awesome! I love to meet all these people, and this is flotilla 3.5, taking place on the Clackamas. Don't fish there if you want peace and tranquility! So, the plan usually is to get away, fish where no one is! Escape! Get away to the quiet out of doors!! Nope! Not this time! I am purposely headed to a river that will be as crowded as heck! Wish me luck... I don't know how to put on chains, and I'm not wearing a short skirt. I can not very easily look helpless in neoprene waders and a Filson hat. No, I didn't write anything heart wrenching... Just stuff. I'll attempt to recap, but the mood has passed! Snow! I'm driving to the coast range today with the kids so we can sled down the snowy hills! Fun! We are finally going to have snow... RIGHT? I'm really excited about the ifish Springer Contest. I have to figure out state rules on contests, and figure out check points. It'll be a blast once I get it ironed out. Look out for high water! From the sounds of the forecast we will have plenty in the rivers for the whole week. Time to clean the corks on my rods, polish them, get out the springer gear... let's see.... What else? I am dedicating the week to cleaning out tackle boxes, doing web work, figuring out the springer contest, and cooking up some wonderful food to eat! Down comes the hail outside. Time to stoke the fire and get on with my work. O.K., where is it? I slept like a kid waiting for Christmas last night. Snow! There is going to be snow! Where? Where is the snow? I don't see any snow! When I went in to wake the kids, their sleepy voices echoed, "Mom, did it snow?" I still have that kid in me today. I remember that restless sleep, that excited sleep, where you can't wait for morning, and when you finally wake, it's too dark to see. Sometimes the moon's glow on the lawn makes it look like snow, and then.... down go your hopes and dreams... No snow. 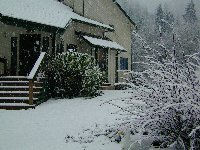 --or perhaps you wake to a little snow, quickly turn on the TV and watch the listings of school closures. None today for us, I see. Good memories, any way you look at it. I am so tempted to send the boys to school, as if it were a normal day. Then I'd pick them up, with all of their snow clothes, inner tubes, and Kilchis in tow. I'd head for the summit of highway 6 to play in the 8 inches of road side snow that they have! I might just do that! They would be thrilled! I would be thrilled! Kilchis would be thrilled! Wah! Where is the snow? They said snow!!! And I told the boys they have to go to school. The other day I woke to a calm sky. I walked Kilchis outside to take care of his business. The birds were noisy and joyful. Spring! I instantly had visions of long days, morning birds, sunshine! It is January, yet it felt warm and alive. The days are getting longer now. Occasionally in mid February we are lulled into a sense that winter is over. Week-long stretches of warm sunlight tease us into a sense of spring. And then.... bold, cold winter! About 4 in the afternoon, I hear the call of the river. Of course, I hear it all day! It teases me as I work, but I just can't resist the 4 'o clock call. I round up the dogs. Both of them now know what "Let's go fishin!" means. Off to the garage to get my rod. The dogs jump and race at my feet. Kilchis has learned to do what I call "the wilders", racing in circles in the wet lawn, digging his claws in, ears back, ready to go! Down at the river, shin deep in my knee boots, the water slaps over the edges and gives me a cold wake up call. Back up, Jen, you should have worn hip boots! I stare vacantly across it's winter wide expanse to the opposite shore. There falls cold clean water, off the hillside. It tumbles down, smashes into the rocks, finally mixing with the water that was well on it's way to the ocean. My ears fill with the rush of the river. My eyes search through the tall trees until I find him. A bald eagle, perched on the highest tree, searching for food. His gaze intent on my action. What IS she doing with that stick? I laugh out loud at how silly I must look to him. Kilchis wades out to greet me. Smelling quite like 'rolled in' rotten salmon, and immensely pleased with it, he tells me it's cold out. He's shivering. Hail begins to dance off the rocks on the shore. I begin the long hike back to the house. I stop at the bunny cage to fill their feeder, toss them a carrot, note that I need to clean their cage tomorrow. Next stop, chicken cage. I'm feeling quite like the little farmer now. All winter we have collected very few eggs. The chickens were molting, the sunlight was short. One or two eggs would find their way to our refrigerator. The neighbors have been buying their eggs at the store, as we have had no surplus. As I ducked into the laying house, I was surprised and delighted at each nest! It's hailing outside. The harsh truth of winter is still here. But there is hope. I thought to myself in anticipation... I can sit here and work, and keep both slippers on! No constant begging for attention, no squeaky toys, wagging tails wanting to play fetch... Peace... Quiet!!! I could take a bath for two hours and not have a dog licking the bath water, jumping up on the borders of the tub... "What's up, Momma, what's that water for? Huh? Can I knock over your glass of water?" I am sitting here, working to pay for it. As the wind howls outside and the river rages, the house is quiet and still. It's morning! Mom's up! I'll just trip Mom all the way downstairs to go get a doggie treat! 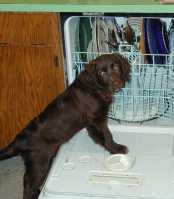 Then I'll take it outside to do my puppy business, come in, eat, water, wag tail, play, bother Mom, steal her slippers! I'll shred Kleenex on the floor and chew all the wrong things, even though I have 50 toys! He comes in to the office with his dish in his mouth, wagging his tail. "You forgot. Mom! Didn't ya, didn't ya, huh?" No, Kilchis, Mom didn't forget. Puppies can't have food before surgery, Kilch. All toilet seats are down, so he can't partake in the cool, refreshing water of the ceramic springs. "Mom! Thirsty!" He barks at the toilet. "Kilchis, Mom loves you". I give him a hug, and he feels my guilt. Soon, all was forgotten, and forgiven. A waggy tail came back as he sniffed the other animals checking in for pre surgery. One last kiss, as the vet took him in his arms. I held him, looked in his eyes and felt criminal. I heard a whimper and a whine as the cold steel cage closed in on him. I drove home, and the rain, the wind, the dark clouds closed in on me. I walked into the house, and for a minute, thought of the dog that would greet me when I walked in. Nope. It's quiet. I had forgotten already. Would they think it was crazy if I called and asked how he is, already? The temptation has passed, and I'm doing OK so far. I glance down at my slippers, and I wish that one were gone. He's got me already. The animal has my heart. I'm a goner. Pathetic. I can pick him up at 4:00. I just know my eyes will well up. When I walk in, I think I will say, "Hi! I'm here to pick up my heart." My kids are embarrassed to go sledding in public! What's up with that? When do they get over this? Come on! When I was 21, I remember tying my Malamute, Earl, up to a sled in Cannon Beach and having him tow me downtown! I stopped at the store and got him an apple, and he towed me right back! I wasn't embarrassed! It was fun! Is it a guy thing? 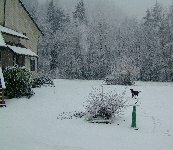 It is snowing hard here, in the Kilchis Canyon. 32 degrees, you can't see bare ground anywhere. I have 2 dozen juncos, one Varied Thrush, four Chickadees, and a woodpecker on my porch, where Bill just laid out some seed. My cat, Jack, sits in the window, warm and dry, watching his bird aquarium intently. Kilchis is dying to go out and play, and so am I! I headed to church this morning, as usual, but as I progressed, so did the storm's intensity. The snow fell. The radio played a quiet, a capella version of Amazing Grace. It sent me for a slow drive back home. I am happy here, inside... but not for long. Upstairs I go, out of my church clothes and into my snow clothes! I am going out to sled! I don't care if the boys come or not! I bet that they will. They will watch for a while, and point and laugh at me. But they'll join me. I know they will. They just can't help it. Then I'm going to get my rod and fish in the snow. A snowy steelie! YES! If I ever say, "Let's have a Spring Chinook Contest!" ever again.... remind me that it is a lot of work! It will be great fun, but man, ifish hats need to be shipped over to Jack's Snack and Tackle on the Sandy... Oh yeah, and Gary's Great American Tackle wants to do it too! Fisherman's Marine & Outdoor? OK! Both Fisherman's are check points, and they will have ifish hats. G.I. JOE's was going to do it, but now doesn't think they have time, as they have their own contest to do. Tillamook Bait Shop is in, and so is Englund Marine in Astoria, because, remember-- The Young's Bay fishery puts out some pretty early fish! Details--Fish tails! From nose to tip of tail, or weight? Finally a nice fellow towed me to the garage, and as I thawed out in the garage, I got through to Bill to pick me up. It's time to call the Official Ifish Ford dealership, Doherty! It's great fun to have an ifish car dealership join us! I need a car NOW! Dave at Doherty said he'd even drive one down for me! :) Bring it on! Seems just as I make enough money to feel like I'm ahead, all heck breaks loose. But you know what? I'll be OK. I always am! You make as much money as you need, right? You make more, you spend more, like it or not. I ordered a free video to watch about Disneyworld. I'm going to go put on my swimsuit, make a tuna sandwich, (and put some sand in it just for effect), turn the heat up, and pretend I am at Disney's World famous Blizzard Beach. Grab me a soda! I think two hours of that should cure me quite inexpensively. My dogs, my rod and me... on the snow covered rocks of the Kilchis River. That'll pay the bills, right? Please don't forget to help our Trask hatchery! Brad sent this nice picture of two steelies in, yesterday. I declared them winners, because... well... I can't seem to catch steelies this year! I can't! I can't remember what a corky bite feels like, and it is very frustrating! I feel like a failure this year! Wah! Off I go, back to work. Tons of updates for other sites.